This avocado dressing I put together for a taco salad craving day. I amazingly had on hand all the ingredients listed. I just added some left over taco meat I had frozen from a meal a few weeks prior. Thawed the meat, made this easy salad dressing recipe, put all of it on a bed of lettuce with a few corn chips on the side. 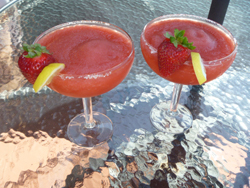 Serve with a pitcher of strawberry margaritas and whhaa-lahh, one easy fun dinner! Prepare the guacamole style dressing. In a bowl add crushed garlic and peeled avocado. Mash with a folk. Add green salsa, lime juice, salt, sugar, hot sauce and mix. Gently mix in the onion and sour cream. Stir in milk, adding only what you need to get the desired consistency. The dressing is best if a little on the thicker side. Press the avocado pit into the center of the dressing, which will help retain the color. Cover and chill dressing until serving time. Some Avocado facts: There are many varieties of avocados. Most common and my preference is the Haas avocado. Found year round in most supermarkets. When selecting an avocado, feel if uniformly hard or soft with an unblemished surface. If it is hard, that means it needs to ripen a few days. Ripe fruit bruises easily in the stores and in transport. I feel it is best to ripen your own at home, Using a brown paper bag, ripen at room temperature 2 to 5 days away from direct sun. Once ripe, your avocados can be stored in the produce drawer of your refrigerator for 1 to 2 weeks.